Aus der James Stirt Collection, Vevey in der Schweiz, erworben 1997 bei Heidi Vollmöller, Zürich. Dr Christos Tsirogiannis has pointed out that an image of the situla appears in the Becchina archive. He notes: "A handwritten note indicates that the images were sent from Raffaele Montichelli, a convicted antiquities trafficker, to Becchina on 18 March 1988". The image shows that the situla is covered in salt encrustations and is presumably relatively fresh out of the ground. Dale Trendall [not Sir John Boardman as in the catalogue] described the Lycurgus painter as representing "the culmination of the second phase of the 'Ornate'" (Red Figure Vases of South Italy and Sicily, p.80). 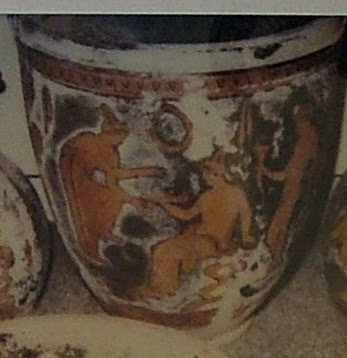 The Becchina image suggests that this situla surfaced post-1970. The Munich auction-house needs to be seen to act responsibly, to withdraw the situla from the auction, and to contact the Italian authorities.